« Discovering Paintings : Robert Bevan ‘Showing at Tattersalls’ c1919. 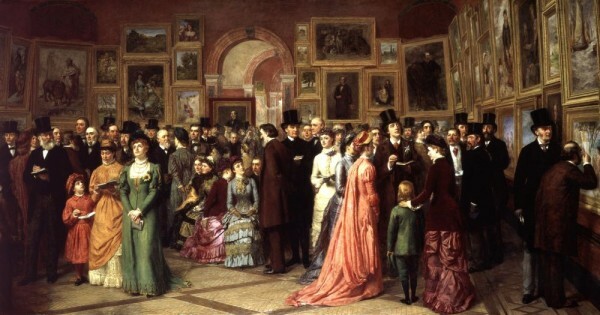 W.P.Frith : A Private View of the Royal Academy Exhibition 1881. The new series of Art Appreciation talks at the Ashmolean Museum, Oxford, started this week. The aim of all our Art Appreciation sessions is to explore the paintings hanging in the Ashmolean within their physical, cultural and historical contexts. 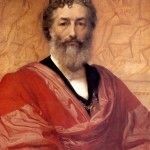 EXPLORING BRITISH PAINTING 1880-1920 Wk1 16th October 2012. The period around 1880 saw a profound upheaval in British Art – central to an understanding of this ‘revolution’ were two factors – firstly the foundation of the Slade School of Fine Art at University College, London (1871) – secondly the formation of the New English Art Club (1886). The work emanating from that revolution does not to our eyes, seem revolutionary – but at the time the established art world and accepted taste regarded the results with horror. For us now-a-days it is necessary to explore the background to try to understand the context of the revolt. 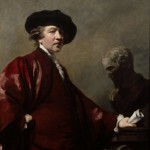 We need to skip back a hundred years – in fact to 1768 and the foundation of the Royal Academy of Art and its first President, Sir Joshua Reynolds. The Royal Academy was seen as the culmination of attempts to raise the status of the artist from artisan to ‘professional’ – to sit alongside other members of the influential middle-class – alongside writers, musicians and academics as well as politicians, lawyers, and accountants. The RA was founded as an art school – training artists in the ‘right’ way. Reynolds gave lectures (‘Discourses’) to students – which were also published – setting out the aims and goals of Art. Subject-matter had a hierarchy. ‘History Painting’ was at the top of that list – which meant subjects drawing on classical and biblical themes as well as straight history – all having an underlying ‘moral’ meaning or message. The Annual Exhibition was established to provide funds for the RA Schools but it quickly became a major focus for artists and prospective patrons alike. The RA and the Annual Exhibition became the acknowledged national arbiter of taste – and so it remained. Thi is the context in which our 1880 ‘revolutionaries’ found themselves. In the middle of the nineteenth century annual exhibitions, not just the RA’s, became common but the general climate was conservative. In the middle of the century the PRB (Pre-Raphaelite Brotherhood) had attempted to shake the foundations – but with limited success. John Ruskin was inspired by the PRB and sought to raise further the profile of the artist – arguing that Fine Art should be included in university education – again with very limited success until Felix Slade provided money in his will to found Chairs of Fine Art at the Universities of Oxford and Cambridge, and at University College London. Oxford and Cambridge relegated this to a few lectures a year given by the ‘Slade Professor’ – but at University College, London, an art school was founded. A much freer institution than the RA Schools it drew its staff from artists with experience in contemporary France and it soon made an impact on the British art scene, producing generations of students not willing to be bound by traditional (RA) attitudes. As those students graduated they rebelled against the RA and formed a new, very democratic and fluid, group called the New English Art Club. It caused consternation!